LES ANDELYS The Château Gaillard is now just a mighty ruin. Nevertheless, it’s easy to imagine Richard the Lionheart keeping watch here for the advance of the enemy – the French – through the Seine valley. The fortress, which almost blocks the river, was built in just two years between 1196 and 1198. It was the centre of the defence system. This included a network of trenches and a fortified island in the river with chains stretched across it. Wooden posts were erected in the water to prevent ships from crossing. 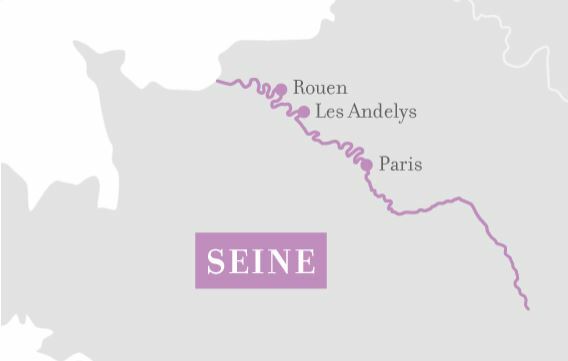 Today, Les Andelys enjoys a peaceful, picturesque location amid rugged limestone rocks, green fields, the river island, the Hôpital Saint-Jacques and the Saint-Sauveur church tower. From the ship, you can go for wonderful walks through the small town’s blossoming lanes towards the Gothic abbey church and, of course, the castle complex.